Compare this to 1926, when a meager 8,000 students nationwide displayed their English and math skills on the first Scholastic Aptitude Test (SAT). Thirty years later, the American College Test (ACT) emerged to rival to the SAT. competition in the American college landscape. Students striving for top scores often pay for professional test preparation, tying economic status to test scores and ultimately the college admissions process. Sophomore Alain Welliver believes students should prepare for standardized tests before taking them, such as by taking practice tests or courses. Welliver took a Princeton Review course over the summer, costing around $800, but has not used direct tutoring. In two weeks, Welliver’s score improved by over 100 points. He believes the course—and most preparation services—are worth the cost as they improve students’ test-taking skills. Another sophomore, Thrayu Sankarraman, has also started preparing for standardized tests and agrees with Welliver about the value of test prep. The $800 course may seem excessive to some, but others are willing to pay any amount to get their desired score. In a voluntary Arlingtonian survey of 152 students, 36 percent said they would or already have spent more than $500 to get what they consider to be a good test score. In the same survey, 62 percent of students who are not done with ACT and SAT testing said they would be willing to take it three or more times. 50 percent of students done with testing said they took either test three or more times. Although many students in UA have access to a variety of preparation services and countless opportunities to take the tests, some students cannot afford these readiness measures. In a voluntary Arlingtonian survey of 152 UAHS students, 47 percent of students spent no money on preparation materials. The UAHS class of 2017 boasted an average ACT score of 27 compared to the Ohio average of 22 and national average of 21. This reflects a study done by the College Board which holds that areas with a higher economic standing typically score better. Compared with the opinions of students like Welliver and Sankarraman, teachers and college counselors hold different beliefs on the importance of the test. Kathy Moore, the College and Career Counselor at UAHS, said the the ACT and SAT do not truly measure the understanding of students or predict success in the future, but are still fairly important in the application process. Although these tests are a part of the process, Moore said they aren’t the only deciding factor in college admissions. “[College admissions are] very holistic. It’s GPA, rigor of classes, course work, test scores, essays, letters of recommendation, leadership and the list goes on. So there are a lot of factors. [The ACT are SAT] are just one factor,” Moore said. In the voluntary Arlingtonian survey of 150 UAHS students, 13 percent said that they began preparing for the ACT or SAT as a freshman or before. While studying is important, Moore finds ninth grade to be too early to begin worrying about one test. Although students should prepare, even someone who helps students get into their dream colleges, expensive preparation materials are not always helpful. Moore believes students need support and preparation to get the score that they want, but this isn’t always possible for families who can’t pay for repeated testing and study materials. “I think not everyone can afford that amount of test prep, so that’s the frustrating part for me. It creates an uneven field for [students],” Moore said. Brian Stewart, a tutor who has written several test preparation books on the ACT, PSAT and SAT for the company Barron’s, believes several factors determine test scores, not just economic status. These include a student’s starting point, challenging classes and even reading level. Regardless, Stewart indicated an article from Psychology Today titled “Why Do Rich Kids Have Higher Standardized Test Scores?” when asked about the correlation between wealth and testing ability. 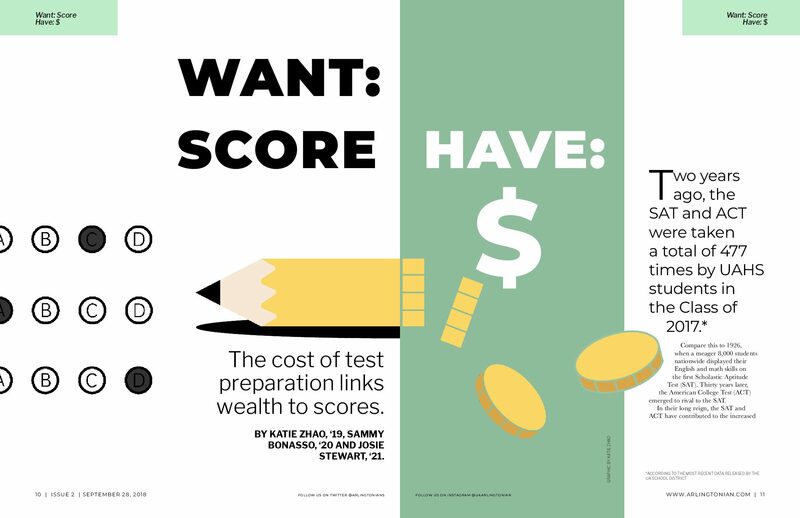 If students are able to afford test prep, they often try to use as many resources as possible. However, test takers can become obsessed with chasing increasingly higher scores. With Upper Arlington’s higher economic status and academically rigorous environment, competitive students may have to dive headfirst into the arms race for extraordinary scores. After all her early preperation, Sankarraman said she looks toward a high score on the ACT. “I would want to expect maybe a 34 or 35,” Sankarraman said. Welliver also hopes to come away with a 99th percentile score. Katie Zhao was born in Ohio, obviously, and is currently the art editor of the Arlingtonian in her senior year. When Katie isn't running around UA catching all the Pokeymans, she enjoys drawing legs on things that shouldn't have legs, designing dank layouts and killing eardrums when she plays the piano.